For more than a century, m.a. 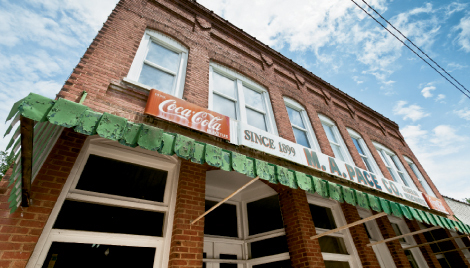 Pace General Store was Saluda’s go-to spot for staples and sundries, from preserves and produce to cookware and hardware, candy and toys to clothes and books. In a town some distance from large grocery stores, it was a local oasis for life’s necessities. The store also served as a kind of informal town square and information clearinghouse, a place to catch up with neighbors and swap stories. While parents talked and shopped, kids scampered around the hardwood floors ogling the selection of confections. And those who pocketed a jawbreaker without paying were squirted with a quick blast from the clerk’s water gun. Late last year though, the store abruptly closed, prompting fears that a community landmark would disappear. Running Pace General had always been a close-knit family affair: M.A. Pace, Sr., cofounded the store in 1899 and owned it until his death in 1945. Four of his children, Eunice, Euva, Nolan, and Robert, took the reins. Robert was the last to run the store, until he passed away in October 2010 at age 87. Saluda’s oldest business was suddenly in limbo. Its shelves were still stocked, but the doors were shuttered while Robert’s daughter, Kay Richardson, weighed the options. The path forward became clear in April, when Judy and Leon Morgan, whose family has been in Saluda for nine generations and owns an antique shop next door on Main Street, purchased the business. Pace General re-opened in June, a day before its 112th birthday. The new owners are keeping the Pace name, and sticking close to the traditions that made the store a local institution, says Tangie Ciarvolo, one of the Morgans’ daughters. She’s also quick to mention a family tie to the store: One of her great-grandfathers worked there in the 1920s. “We’re trying to modernize a bit without going too far, and keep it how they always had it,” Ciarvolo says. She’s helped fill just about every spare space with displays of relics from the store and Saluda’s past: old photos, telephones, signs, garments, tools, and appliances. “Some of this stuff you just don’t see anymore,” she notes. So while Pace General still has thousands of traditional and contemporary items for sale, it’s also a museum of mountain memories that will carry on a family legacy.